Product prices and availability are accurate as of 2019-04-19 21:30:43 EDT and are subject to change. Any price and availability information displayed on http://www.amazon.com/ at the time of purchase will apply to the purchase of this product. New from Krups, the XP7260 with the Auto Cappuccino Kit will be the MOST COMPACT fully automatic espresso machine on the market. The XP7260 was designed to be simple to operate and easy to maintain. Coffee experts agree, the ideal process to achieve maximum flavor without over extraction is to grind and brew under high pressure within a short period of time. 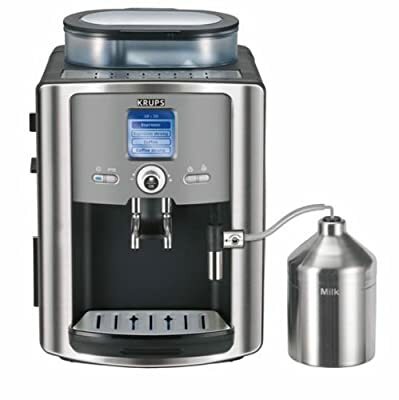 An automatic espresso machine combines all the necessary steps to brew a perfect espresso and simplifies the process. The XP7260 Compact Fully Automatic Espresso Machine is 30-50% smaller then most fully automatics available. Fully Automatic: With a simple touch of a button, the XP7260 grinds the beans and brews delicious espresso with ease. Small is better: Revolutionary technology exclusively from Krups provides the luxury of a fully automatic machine in a practical compact machine. By combining the thermoblock, brewing system and hydraulic jack into a single piece, Krups creates a fully automatic machine that is 30-50% smaller and highly efficient. The completely redesigned thermoblock is cast in aluminum and has stainless steel tubing to allow for a precise control of the water and temperature and optimal transfer of heat while reducing scaling and build up of mineral deposits. The stainless steel brewing chamber rests on top of the thermoblock allowing for a hot cup of coffee right from the first cup while ensuring a rich, full flavor with an excellent crema. User friendly Interface: The oversized digital display and intuitive controls are easy to use. 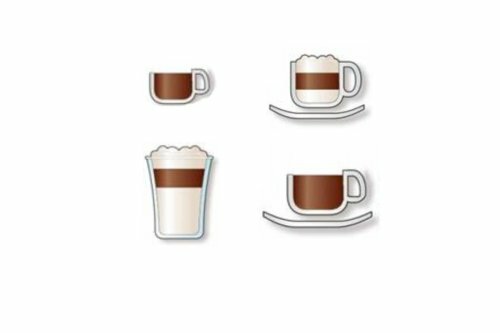 The simple on screen instructions walk you through all the steps from set-up to brewing perfect espresso. Easy to read digital display and controls allows you to scroll through the on-screen menu and press the knob to make selections. Clear text and graphics are easy to follow. Choose whole beans or ground, your choice. Built in conical burr grinder holds up to 28 oz of whole beans.